Anyway, I've been waiting for someone to help me install my curtain rod in my bedroom since March and my dad finally came over while I was working on Saturday afternoon. The curtain rod is a brushed nickel with a cage-like finial on each end. It is installed about six inches above the window, but also six inches below the ceiling, so that I have the two panels ending just above the carpet. 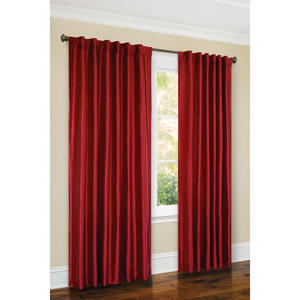 Floor-to-ceiling drapes seem to be a current trend. Arranged much like the picture above, this pair covers two-thirds of the large window width-wise. I need another panel or two to completely cover it. I love them already. They really do help to complete the room. I hope it is a lavish feel because they are red and silky.